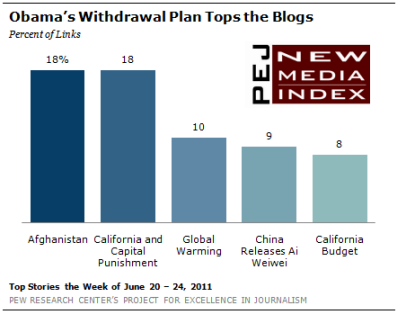 Bloggers, last week, responded strongly to President Obama’s June 22 speech about the U.S. role in the Afghan war. Reaction to the announcement, which proposed to remove 10,000 troops this year and a total of 33,000 by next September, received 18% of the news links on blogs from June 20-24, making it the No.1 topic, according to the New Media Index from the Pew Research Center’s Project for Excellence in Journalism. And by a margin of almost 3-to-1, the reaction was negative. In a broader examination of more than 11,000 blog posts, utilizing computer technology from Crimson Hexagon, 36% of bloggers’ assessments were negative compared to just 13% that were positive. About half (51%) of the conversation was neutral. These responses were more critical than public sentiment overall. A survey conducted by the Pew Research Center for the People & the Press and The Washington Post following the speech found that a plurality (44%) of Americans think Obama will remove troops from Afghanistan at about the right pace. A number of bloggers, including liberals who tend to support the President, wanted Obama to withdraw all troops from the country and declare an end to what they see is an unwinnable war. A different cohort argued that Obama was not committed to doing what is best for American interests-winning the war. Instead, they suggested Obama’s plan to pull out troops goes against the wishes of top military commanders and puts at risk any progress that has been made. A small minority of bloggers supported Obama’s plan and suggested he had found a centrist strategy that would lead to the end of the war without having the country result in chaos. The past week marks the first time in nine months that the Afghanistan War has led the conversation on blogs. The inspiration largely stemmed from strong disapproval of Obama’s withdrawal plan, which came in all forms. The most common criticism was that we should instead pull fully out of the war, ending our presence there altogether. 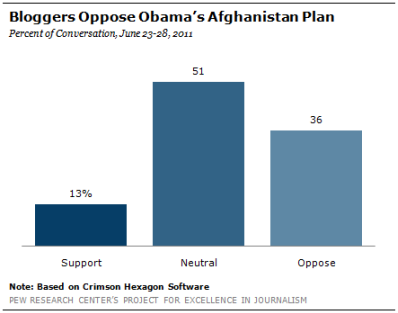 Some who were against war also expressed waning support for Obama. Others, primarily on the conservative side, faulted Obama for not doing enough to “win” the war and going against the recommendations of two high-ranking military commanders. There were some, though, that felt Obama should have stood up more to the military generals. While in the distinct minority, a few people applauded Obama’s decision. A number of bloggers reprinted the text of a June 26 piece by Washington Post columnist E.J. Dionne who defended Obama’s attempt at taking a practical, middle road. Elsewhere in the blogosphere, the top stories were a mix of domestic spending issues, global warming, and the release of a renowned artist from prison. The second-largest story, with 18% of the links, was a study showing that California taxpayers had spent more than $4 billion on capital punishment since it was reinstated in 1978. The study, conducted by a judge and a law professor, concluded that since there have been 13 executions during that time, the cost works out to $308 million for each one. For a state that is facing dramatic budget problems, bloggers agreed that this expense was untenable. An Associated Press story about Al Gore’s criticism of President Obama for his lack of leadership on the issue of global warming was third, at 10%. China’s release of Ai Weiwei, a dissident artist and activist, from prison on bail after being held for two months without formal charges was the No. 4 story at 9%. Weiwei had attracted international attention for his criticism of the Chinese authorities and had been the subject of a segment on PBS’ Frontline in April. And a Los Angeles Times story about State Controller John Chiang’s decision to deny state lawmakers pay for failing to produce a balanced spending plan was the fifth-biggest story at 8%. 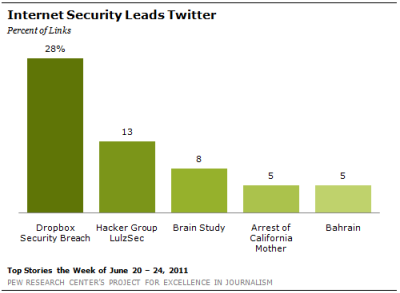 On Twitter, the two largest stories involved the issue of online hacking and security. Stories about a security breach regarding Dropbox, one of the most popular web sites to share and sync files, were the top subject with 28% of the links. The site admitted that a bug resulted in unfettered access to all of its 25 million customers’ online storage lockers on Sunday, June 19, for a period of four hours. Twitter users took to the social networking site to warn others about the lapse in security. “For four hours on Sunday, anyone could get in any of Dropbox’s 25 million accounts using any password,” retweeted a number of Twitterers while linking to the Wired story on the event. A worldwide hacking group known as LulzSec, which claimed responsibility for hacking large organizations around the world including the U.S. Senate and companies such as Sony, was the second-largest subject at 13%. Many Tweets linked to a story by the British Sun newspaper that announced a “nerdy teenager” named Ryan Cleary was arrested in Essex for supposedly running the operation. A study by German college students that suggested that the brains of people who live in urban areas are more susceptible to stress than those that live in rural areas was third, at 8%. At No. 4, with 5%, was a gruesome story about the arrest of a California mother after investigators discovered her baby likely died from burns suffered in a microwave oven. And a report by Britain’s newspaper The Independent about accusations that the government of Bahrain systematically tortured patients in hospitals that were suspected of participating in anti-government demonstrations was the fifth story, also at 5%. On the video sharing site YouTube, the June 15 riots in Vancouver, British Columbia, following the loss of the city’s hockey team, the Canucks, in Game 7 of the Stanley Cup Finals drew significant attention last week. Four of the top five videos focused on the chaotic events. The top video, posted by Russia Today, shows angry fans setting cars and garbage on fire, smashing windows, and throwing beer bottles at the plastic shields of Vancouver police. The fourth video, titled “Global News – Vancouver riot participant apologizes,” is no longer available because the uploader has closed his/her YouTube account. And the No. 5 video is footage that aired on CBC News showing a car on fire with voice-over comments on the frenzied situation. The time frame for the analysis is June 23-28, 2011, which is different than the normal NMI week, Monday through Friday.